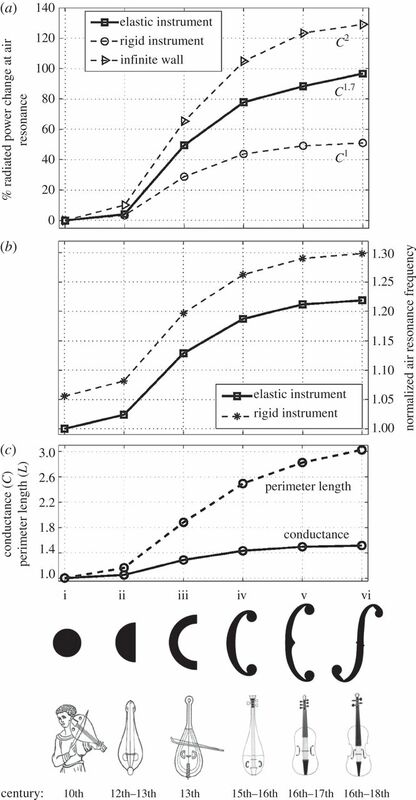 Why did violins slowly develop f-shaped sound-holes? Because it makes them more acoustically powerful than their ancestors, which had holes shaped liked a circle -- as a team of MIT scientists recently concluded. Back in the the 10th century, the makers of European stringed-instruments were building "fitheles" -- the ancestor of the modern violin -- but they used round holes. By the 12th century, they'd started using half-moon shapes, and a century later they'd refined it to a sort of C-shaped hole. Then in the 15th century they pioneered little circles at the ends of the holes, which, by the 17th century, had become the modern f-shaped hole. "The answer, arrived at after several pages of advanced mathematics, and confirmed by experiment, is that holes’ sound-amplification properties depend not on their areas but on the lengths of their peripheries. They showed how the shape of the hole varied over the centuries, and how that affected its power output. The final Cremonese design had twice the sonic power of the circular holes of the fithele." The entire paper by the MIT team is online here and is pretty interesting too. That image above shows the gist of what's going on: You can see how the f-shape drives much more air-flow than the round one, with high air-flow marked as yellow and red. Below, an image from the paper showing the increase in power as the shape changes over time.